The people in charge at MyBookie have set forth a bold objective for their organization - to be a game changer in the online sportsbook industry. Classifying their group as some of the most experienced, highly-skilled online gaming professionals, many whom were pioneers in the online gaming, and the evolution of social media marketing as we know. BONUS INTRODUCTION – MyBookie offers two sign up bonus options - 50 percent worth up to $3000, or 20 percent bonus worth up to $500. While there are numerous countries for which MyBookie is off-limits, the good news is that the United States is not among them. U.S. players can open accounts at MyBookie and bet to their heart's content. However, France, Hong Kong, Italy and the Czech Republic aren't so fortunate. All are on MyBookie's lengthy list of prohibited countries. 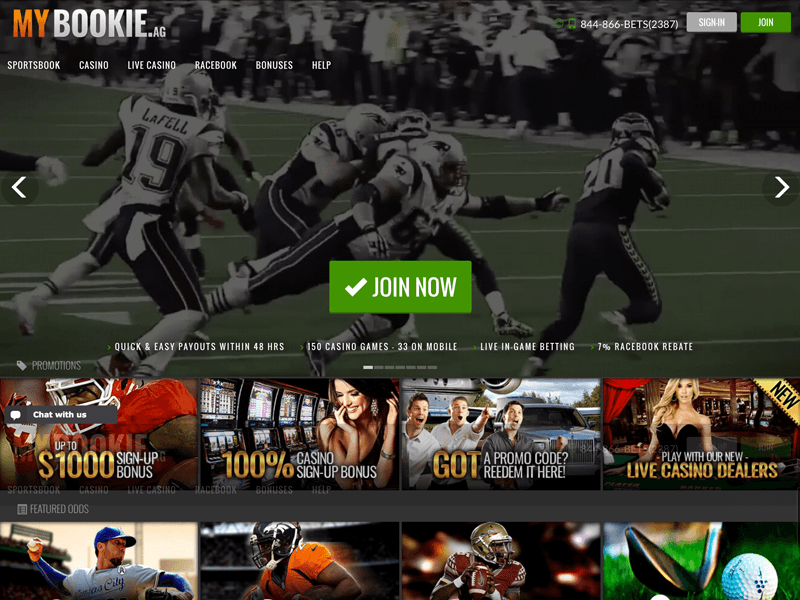 MyBookie offers two sign up bonuses, each based on a minimum deposit of $50. There's a 20 percent bonus with a $500 maximum that can be garnered by entering the code MYB123 into the cashier when making your intitial deposit. Rollover requirements range from 10-50x depending upon the amount of the deposit. There's also a 50 percent bonus worth up to $3000, again with a minimum deposit of $50. In order to receive a bonus you must use promo code MYB50 in the cashier when making your deposit. There is a five to 15-time (15X) rollover requirement associated with this promotion depending on the deposit amount. As well, they offer a 100 percent refer a friend bonus worth up to $100. And there's no limit to how many friends you can cash in on. You can utilize both Visa and MasterCard to make deposits to your MyBookie account. Bitcoin is also accepted, as are bank wire transfers, person to person transfers and phone transfers. The payout options at MyBookie include Bitcoin, bank wire, check by courier, debit or credit card, and via Western Union. Every withdrawal method comes with some form of fees. They claim a two-day time limit is required to process any withdrawal. If you've got a question or a concern, there are a number of methods to contact the MyBookie customer support team. You can fill out a form on their web page and they were contact you via email, or you can access the live chat function through their website. There are also a number of toll free numbers listed on the site, depending upon the question you need answered. A sportsbook that is weighted towards American clients, you will find heavy emphasis on the popular North American sports such as the NFL, NBA, MLB and NHL. There's also plenty of U.S. college sports wagering available on NCAA football, basketball and baseball. You can also get action on golf, tennis, boxing, MMA, international basketball and baseball, and some very off the wall wagers. The most sensational of these would be MyBookie's future book on who will be the next Pope. Cardinal Luis Antonio Tagle of the Philippines is the favorite at +500, with Cardinal Marc Ouellet of Canada a close second at +700. Or you can make a reach and play Bono (yes that Bono) for +1500. You can even wager on the name the next Pope will chose. Francis and Leo are co-favorites at +400. Aside from the standard moneyline and total bets, you will also find parlays and teasers, along with round robins and if-bets available at MyBookie. They offer an extensive list of future bets in all of the major pro sports, and lots of prop bets. The lines are posted quickly at MyBookie and the odds given are comparable with most of the major sportsbooks. 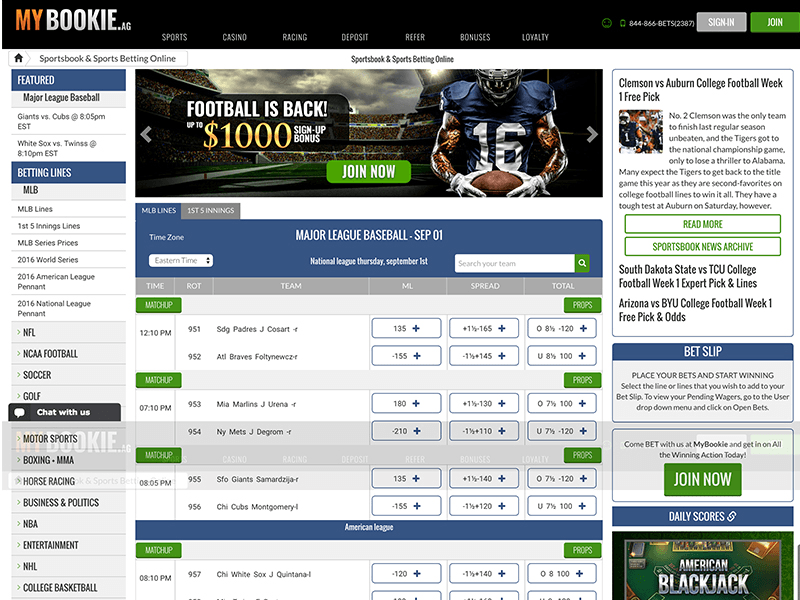 The live betting options at MyBookie are plentiful. You will find them listed down the left side margin of the MyBookie web page. On the NBA finals, for example, there were options for quarter and halftime total score bets. During the Stanley Cup final, you could wager on period scores and team goals. During regular season play, there are live betting offers and selected games from all of the major sports. 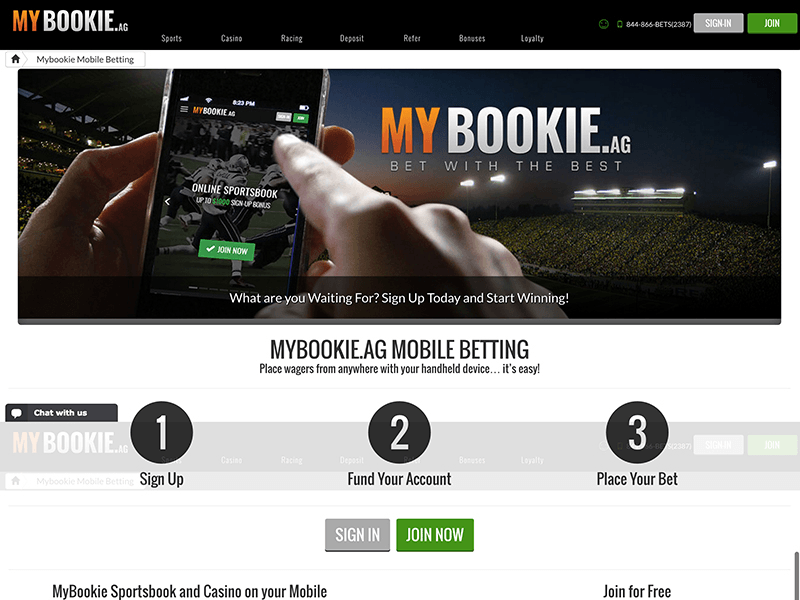 The MyBookie mobile betting platform offers many advantages and added benefits to site members, including a hassle free interface, easy to navigate menus, as well as access to their complete set of betting lines. It's a free to use mobile sportsbook interface, with no download necessary, providing instant ability to place bets from your favorite handheld device. You will have access to odds and lines on all major sports from auto racing to NFL and college football, they’ve got every sport you want covered. It also offeers access to dozens of online casino games, including classic titles and state of the art 3D slots and progressive jackpots, and is available from any country and location in the world. The collective vision is to redefine the gaming industry by establishing MYBookie.ag as the world’s leading online sports betting and gambling website through the fundamental three R’s: Reliability, Reputation, and Real fast payouts. With a stellar website, rich promotional offers, and solid odds in just three short years of existence, MyBookie has grown to be a major player in the online gaming industry in short order. The bonus and promotional offers start when you join MyBookie and never stop. Beyond their sign up bonus offers, you'll find a 25 percent reload bonus worth up to $500, and a $20 risk-free bet. They also want to reward you whether you are hot or cold. Nail 10 winning picks in a row and you'll earn a $25 free bet. Hit 20 straight and receive a $50 free bet. On the flip side, lose 10 in a row and MyBookie will grant you a $25 free bet to try to get back on the winning track. We're barely scratching the surface here. Check out the MyBookie website to see how deep their promotional offers go. MyBookie offers a 100 percent matching sign up bonus when you join their casino. This promotion is only available to new cash accounts and the maximum bonus per deposit is $300. Use the Promo Code MYC100 to access this offer, which comes equipped with a 50x rollover. You will find a deep calendar of horse racing offerings, both flats and harness, in the MyBookie racebook. t MyBookie, you can savor the excitement of betting on horse racing and also get a seven percent rebate on the action you play in the racebook. Just make your wagers and each week, seven percent of the total from qualified tracks will be deposited right back into your account. The amount paid may vary depending on the bet and track. Players who only bet Straight Bets on Tracks A-B-C are entitled to receive three percent. Exotic bets pay seven percent on A tracks, five percent on B tracks and three percent on C tracks. Close Visit MyBookie and see for yourself... Ok! Let's Check Out MyBookie!